According to the principle of 'Chinese Whispers', we initiated a game with language. A text makes three journeys through different languages and is finally translated back into German. What happened to the words throughout the journey, how is a text transformed? Each player added their own imprint to the words and consequently changed their original meaning. There is no 'wrong' translation. The course of the text permits a closer look at the possibility of multiple interpretation- and gives us a chance to consciously examinate what it feels like to not-comprehend. The focus is directed towards the heterogenity of a regional population. 'Stille Post' is an art project for the public domain; it makes its appearance both visually and acoustically. 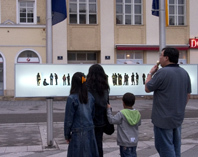 It is presented in the form of an image/sound object, which is on exhibition throughout different cities of the Mostviertel with a duration of 2-4 weeks each. It is about listening, about the silent tones and everything that happens in between the lines.